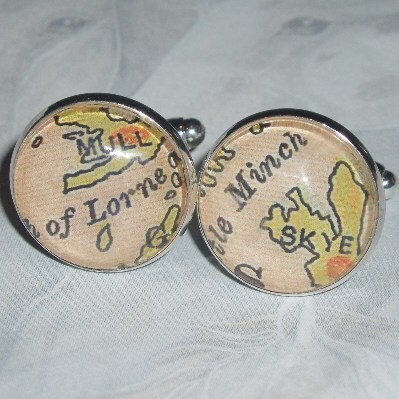 Scottish Map Cufflinks featuring the Isles of Skye and Mull in Scotland. Round handmade 18mm glass cabochons featuring maps of the Isles of Skye and Mull in Scotland, securely glued to silver plated cufflink bases. These Scottish Map cufflinks would make a unique gift for anyone.